Hypnosis has been around for hundreds of years and therapists are still finding new ways that hypnosis can help to alleviate physical and psychological problems. By speaking directly to your subconscious mind, hypnosis can work directly to help your body. Hypnotism can be used to help with many problems, such as aiding recovery from anorexia nervosa, controlling binge eating and bulimia, and building self esteem and confidence. Whatever problem you might be suffering with there is a good chance that hypnotherapy could help. As with anything, hypnosis can be good, bad or indifferent. The most common is old style authoritarian hypnosis of the type, “You are getting sleepy… You are feeling confident… ” Unsurprisingly, this sort of hypnosis doesn’t work well with many people. Good hypnosis uses subtle psychological principles and advanced communication patterns. It's like the difference between a football coach who thinks you’ll perform best if he yells at you, compared with the more elegant style of a great leader who knows that to get the best from his people, he needs to understand motivation, to cajole, encourage and reward. 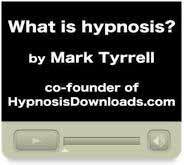 Hypnosis Downloads offers hundreds of sessions using the best type of hypnosis to download for use in your own home and as many times as you feel it is necessary. Subliminals are words that you can't hear. Common sense says they shouldn’t work, and there’s no research proving that they do. So there is no need for concern that a download or a therapist can give you silent messages to affect behaviour in a way you don’t want. The only reason you can’t be hypnotised is if you are incapable of paying attention due to extremely low IQ or brain damage. That’s not to say that every hypnotist can hypnotise you however. The more flexible the hypnotist, the more effective she will be with the largest number of people. If you couldn’t go into hypnosis, you wouldn’t be able to sleep, to learn, or get nervous through ‘negative’ self hypnosis; you know, when you imagine things going wrong and it makes you feel anxious? Well that’s self hypnosis! Hypnosis is a deliberate utilisation of the REM (Rapid Eye Movement) or dream state. If it wasn’t a natural ability, hypnosis simply wouldn’t work! Crazy news stories, stage hypnotists and gossip have created the illusion that you lose control in hypnosis. In fact, when hypnotised, you are relaxed and focused, and able to choose to get up and walk away at any time. You choose to give your attention to the hypnotist, and you can withdraw it at any time. One lesson every two days gives your self hypnosis training time to ‘sink in’, 5 audio sessions: Every training session is supported by an audio hypnosis session to give you real experiences of hypnosis. Worksheet download: A printable pdf to support your course and refine your knowledge. Free trance script: Marked with hypnotic language patterns in downloadable, printable pdf format. Free monthly newsletter: Audio insights, special offers, product launches and more. Paul McKenna PhD is probably the UK’s best selling non-fiction author and the World’s leading hypnotist and an expert in the power of the human mind. He has appeared on television many times, not just in the UK but all over the world. You might like to check out the various books, CDs, downloads and DVDs available on the Paul McKenna website. The important point to remember with hypnosis is to make sure what you're getting is the real thing. As well as the comprehensive hypnosis downloads mentioned in this article, you might prefer to see a therapist on a one to one basis. The Register of Hypnotherapists contains a list of qualified therapists.